My original plan for the Sunday after PointsU was to spend some time exploring Calgary, since I’d never visited Alberta’s largest city before and was intrigued as to what there was to see. Much to my disappointment, it turned out that there wasn’t actually much to do in the city itself on a freezing cold November day, so instead, I hopped into a car with Jayce from PointsNerd, Anshul from Points, Miles & Bling, Ari from AwardMagic, and Norman the King of MS, and we headed off to catch some views of one of Canada’s treasures – Banff National Park. We left the Marriott In-Terminal Hotel Calgary Airport at around 9am. My flight was departing at 6pm, so that’d give us a decent three to four hours up in the mountains, which Jayce assured us was enough time to get a taste of things. Anshul called shotgun – the equivalent of business class on this ride – while Ari, Norman and I “slummed it” in the backseat, which was arranged in a rather cramped 1-1-1 configuration. The drive up to Banff featured some magnificent views. I recall marvelling at finally seeing Canada’s Prairies up close, and it was striking how gorgeously wide and expansive the landscape was. I had previously only visited the Rockies at Whistler, and dare I say the views here were even more beautiful (though of course, I was wishing I could conjure up a pair of skis out of thin air). When we arrived at Banff, we had a few decisions to make as to what we wanted to do. The gondola ride up to the top of the mountain was a no-brainer – after all, having made it all the way out here we weren’t going to be intimidated by the (admittedly kind of overpriced) admission fee of $62 per person. Meanwhile, Ari had been an avid proponent of going for a dip in the hot springs, although by the time we arrived it was clear that he was still out-of-commission from his overindulgence in last night’s festivities 😉 So we just decided to head up the mountain first, grab some food up there, and then see what else we felt like doing afterwards. While the views from the gondola were impressive, it didn’t compare to the breathtaking views from the peak, where you could see all of the town centre, Banff Avenue, the Fairmont Banff Springs, and Lake Minnewanka in the distance, all cast in a layer of white. It looked like something straight out of a storybook. Jayce, Anshul, Norman, and I took a hike up the steps to the peak of Sulphur Mountain, where we were treated to the best views of the morning. Meanwhile, poor Ari stayed in the main building nursing a Gatorade, getting those much needed electrolytes. We grabbed a quick lunch in the restaurant up on the mountain, trying to figure out what to do for an hour or so before driving back to Calgary. 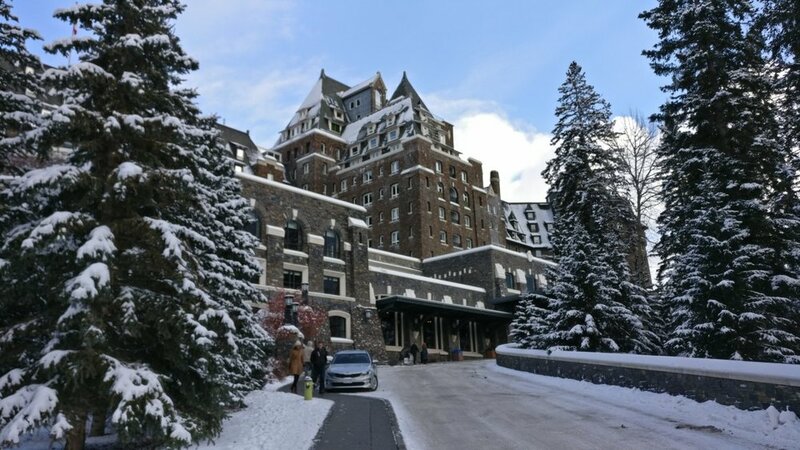 Eventually we decided to check out the Fairmont Banff Springs, a Banff classic and one of Canada’s oldest hotels. The Fairmont Banff Springs is a huge property, and it’s so easy to get lost in its endless passageways, staircases, foyers, and ballrooms. In fact, the mystique and charm behind the hotel’s beautifully decorated nooks and crannies are a big part of its appeal. That’s why four grown men spent an hour or so wandering through its halls, only stopping occasionally to admire the incredible Scottish Baronial architecture or play a game of pool. Before long, it was time to make the drive back to Calgary Airport, where my flight back to Toronto was departing at 6pm. The four of us headed back to the car and rejoined a napping Ari, getting on our way back across the Prairies and bringing my weekend adventure to a close. It was great to hang out with some other prominent figures in our community – we’ve all been in contact before actually meeting in person, so it was easy to get along with each other. There’s always plenty of fun stories to share and strategies to brainstorm whenever groups like ourselves get together (there’s no better example than the PointsU Conference itself), so that was a big plus as well. I had always imagined Banff as a place where you had to spend a lot of time hiking through the park, so it was a pleasant surprise to take a short trip there and see the important sights. Next time, I’d love to come back in the summertime, to enjoy a different angle of Banff’s natural beauty and a much broader range of things to do in the area.